In this economy, you have to watch every penny. Sometimes that means not spending money on furniture and decor for your apartment. 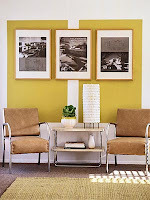 Thankfully, Better Homes & Gardens is here to help with their "Mid-Century Mod on a Budget" slideshow. There are 16 great ideas for affordable decorating, including adding simple touches like black and white photography and using peg board (about $6 at Home Depot) to create a lighting feature. Pretty good idea! For more info, check out Better Homes & Gardens.